Long tail keywords are definitely a better strategy to start with on your blog. 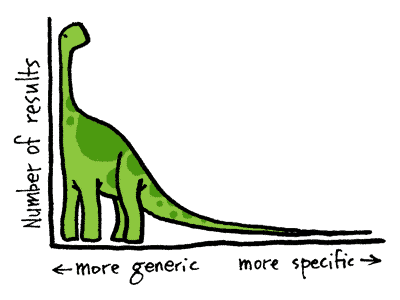 The difference between a long tail keyword and a short tail one is that the second is probably a “generic” keyword. Of course there are some advantages on using generic keywords to bring traffic to your blog, but usually, it’s an inefficient battle you won’t win. The reality is that with such a saturated market you need to work smart. Apple is making its road to a high-end consumer level instead of fighting on the low end. They only produce and promote expensive products with high quality finish, but even some times, they can’t beat the competition on specs and still price the product on a higher level. Simple. You’re fighting into a less saturated and more specific Market. It means that you need to sell 1 iPhone to earn the same money others do while selling 10 generic phones. Well, in turns out that internet traffic works similar. Have you ever done a generic research on Google? Let’s say we want to read information about “digital photography“. Type it on Google’s search bar and something like this will appear. Have you seen the auto-complete function on Google Search? And the more you write, the less results you’ll get, but those results are actually more accurate and specific than the original keyword. Why is this better for your blog? There are many advantages of using long tail keywords on your blog, and of course there are disadvantages too. The main disadvantage is that long tail keywords have less traffic potential than generic keywords. Is that true? Generally speaking, yes. A generic keyword like “Digital Photography” could bring thousands of readers to your blog. But in such a crowded market, there are thousands of people trying to rank high for those keywords and 99.9% of them won’t achieve it. To achieve a top position for a generic keyword like “digital photography” you need an authority blog with thousands of valuable backlinks, a high PR and perhaps even more. If you’re starting a blog, you definitely don’t have that… so, what are the advantages of long tail keywords? Less Competition: By far, this is the most important factor to get traffic. Instead of fighting again 100,000 bloggers, you could compete against 5,000 instead. Accuracy: This is another factor that I’d like you to understand. If there’s a person looking for “Canon Camera UV lenses“, it’s easier to find it by entering that keyword directly on the Search engines, thank looking for “cameras“. This means the traffic you receive from long tail keywords is “high quality” traffic. More engagement: Again, because the people are looking exactly for the things you’re offering. They’re prone to subscribe, buy, comment or whatever you want into your blog. Discovery: You can discover new micro-niches that no one has taken yet. Even a niche inside a niche is doable with long tail keywords. It doesn’t matter if you have only 100 hundred readers, if all of them want to buy your product or service, right? Instead of having 1,000 readers of which only 10 of them will buy you something. As you can see, the original keyword has a lot of traffic potential with up to 25,269 visits PER DAY only if my blog is ranked number 1 on the search results. Sounds cool? I mean, who doesn’t want 25,000 visits per day? That’s almost 1 million visitors per month, only with one article! But wait, now let’s check the competition; we have 86,400,000 competitors for that specific keyword. No way you can reach number one with your new blog. The first pages should be crowded by high authority sites or even global brands (more into this below). Let’s focus on a long tail keyword like: Canon Photography courses. That specific keyword has a potential of 18 visitors per day if I rank on the first page of Google. Sounds good? Not really. 18 visitors per day aren’t that much, however, look at the competition. Only 77 dudes trying to rank for it! I bet I’m better than 77 persons in the world, for sure. How hard is the competition? Looks like Frodo’s quest to Mordor or even more difficult. As you can see, first search results are from high authority sites like DPreview, digital photography school and even Wikipedia. All of them have been on the web for at least 7 years and the Page Rank is higher than 4 with tons of back-links behind them. Unless Google suddenly decides to drop them all you won’t even appear on the first page. Now let’s have a look at the SEO Competition analysis for “canon photography courses“. Now that looks actually doable! This definitely looks doable. Even though some sites have a domain age of 11-15 years, their page rank isn’t that good. Some of them are PR 0 and my site is already PR1-PR2. Also, the number of back-links are way lower than before, so getting into the first 10 results should be an “easy” task after all. Actually, if you remember, there are only 77 competitors in this niche. This means even if I’m the last result on Google, I will appear on the 7th page of Google. Compare that to being on page number 800 trying to rank for “digital photography” and now I look much better. 18 visitors per day isn’t bad either. If you can get to the first spot, that means you’ll get 500 visitors per month, just by 1 article. One of the hundreds of articles you have on your blog. Now that you know the importance of Long tail keywords, work faster and more efficient and get faster results. Even if the results aren’t as good as you expected, you’re building a pyramid based on many articles and posts, which at the end sums up a good quantity of visitors to your blog. Instead of trying to focus on a post to bring 1,000 visitors, focus on 10 posts to bring 100 hundred each. This also backs you up in case Google decides to lower the rank of your post and suddenly you lose all of your traffic. And remember, long tail keywords also give you more engagement and targeted high quality readers, and for affiliate marketers, that’s the best audience you can have. Of course, once you start growing your blog, getting higher PR and gaining authority, you can start focusing on long tail keywords with higher competition levels (and traffic) and outperform the others until you reach the big brands. In case you want to know more about the tool I’m using here to make the keyword research and SEO competition analysis, make sure to visit my Market Samurai Review. Great Post! The long tail is really useful for targeting those micro-niches, especially in the beginning when your page rank is still low! I guess focus on one post to get 1000 visitors 🙂 less effort and more benefit. If you’ve got the power to rank high search volume keywords, for sure, go for it. But for most people starting their blogs, going for low competition keywords is a better start. Well Done. I’ve been clawing and scratching to get rankings while spending the least amount of money possible. Long tail keywords are where its at! While you might not get a long tail keyword search, they are still effective, IMO, with search spiders. I’m not sure how I stumbled upon your blog, but I’m happy it found its way to me. Hats off to your hard work, and cheers to it paying off today and in the future! Hope, you are doing well. I saw this article, commands and conversation. It’s really helpful to people to understand the importance of keyword density of websites. Wish you all the best for your innovative steps. Great!!!!! Thanks for the post – although I’ve practically read everything on Spencer Haws’ site but this still approach it from another perspective. I’ve purchased LTP and some of my pages have been ranking on the 1st page but strangely, the visitorship is still quite low (my site has been around for about 6 – 8 mths) and I’m wondering what could be the problem.. . shd I purchase MS too, to complement LTP? or am I doing something wrong? thanks again. Are you tracking your rankings and do you know the total volume of search queries? It’s my first comment but i read your every article and I am great fan of yours. I am beginners with SEO term and steady and slowly I am learning. I just want to ask you question that how can i link my keywords directly to my website, How google will understand that this keyword is related to this particular site? I know it’s very basic question but I have confusion. Please reply . Long Tail Pro is a great tool for keyword research, along with Market Samurai. This is another good post. As I’ve said here before, I have MS. I’m probably not using it completely right but even I ranked on the first page for a long tail phrase and I’ve only been blogging 4 months. I even have a picture now thanks to your Google authorship post. I have a question. How do you pick the longtail phrases? I don’t really understand all the competition stuff on MS. Next question–I rarely see you comment around the blogosphere. Do you visit or comment other posts? Thanks for the info. I will visit as you write more great posts like this one. There, I share the filters I use and the things you need to pay attention in order to rank your articles, and just ignore the rest. It’s great to know that you have the Google Author picture now! Finally, about the comments, I do comment on a network of my favorite blog I’ve been reading the last months. Probably less than 20, and many of them don’t even use commentluv. But this month has been super hectic for me and I can rarely comment or even write a post here. That’s something I’m changing for May. I’m ready for that, but thanks for the soft reminder. I would like to know whether Market Samurai helps in finding Long Tail Keywords for [Exact] match. Also, how Market Samurai is different from Traffic Travis? Hello Avadhut. Yes, Market Samurai allows you to research on 3 modes: Broad Match, Phrase Match and Exact Match. I haven’t used Traffic Travis so I can’t answer the second question yet. This is the 2nd post I have read on your blog and very impressive. You are creating an authority with your own talent. Good Going Servando! However do you believe that Market Samurai still works well today like before? as there are some good alternatives like IBP and Long tail Pro, so I am confused which one should I buy actually. Thank you very much for the complimments. I’ve read your posts too, and I love them. About Market Samurai, there re a lot of alternatives out there nowadays, but I think still works quite good. Many of them are now cloud based so you just need a computer with internet access and I’ve been thinking on trying Longtail Pro. The only thing I feel Market Samurai is now failing on is on the rank tracking area. Yes, they provide an automated system but now you need to pay for it. Whatever you use (LTP is good), don’t worry that much. Keep creating great content and so some keyword research to optimize it and traffic will come. No problem Emily. In fact, instead of losing your time trying to rank for widely searched keywords and get no traffic, long tail keywords should have a better ROI. Sometimes it’s hard to convince people to go after long tail keywords. They want the 1000 hits a day. Once I explain to them that if they go after much easier to rank for long tail keywords if they ranked number one on ten of them that only got 100 hits a day they would have their 1000 hits a day. But even that, sometimes is difficult to rank even for long tail, depending on the competition. So it’s important to know the competition quantity AND the strength of it.